Ginkgo biloba is a herb that comes from the Ginkgo tree, one of the oldest living species of trees in the world. The tree has no close living relatives. Just like the Coelacanth, Ginkgo is a living fossil since the species is similar to discovered fossilized remains. Ginkgo supplements are among the most popularly used herbal medication. It is traditionally used to treat blood disorders and enhance memory. Lab studies have shown that ginkgo improves blood circulation by dilating blood vessels and reducing the stickiness of blood platelets. 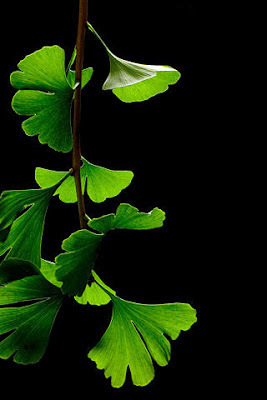 Ginkgo also contains flavonoids and terpenoids, chemicals that have antioxidant properties. Antioxidants gets rid of and minimizes the damage caused by substances called free radicals. Free radicals causes the aging process, some cancers (according to studies), cardiovascular diseases, and athritis. Ginkgo biloba extract come from the leaves which are used in herbal medicines. It is advised that people who take pharmaceutical blood thinners such as warfarin or coumadin should consult with their doctor before taking Ginkgo biloba extracts. Ginkgo biloba has anti-coagulant properties that prevents coagulation (clotting) of blood. The study examined whether a twice-daily dose of 120 mg standardised ginkgo biloba extract – derived from the leaves of the Ginkgo biloba tree – affected the number of participants who were diagnosed with Alzheimer's disease, compared with those who took a placebo. The randomised, double-blind trial took place over five years, involving 2854 people in France who were 70 years old or over, and who had presented to their primary care physician with memory complaints. 1406 patients were given the ginkgo biloba extract, and 1414 given a placebo, designed to have a similar taste and appearance to the ginkgo biloba pills. Over five years, researchers used standard tests to assess the patients' memory, cognitive function and dementia status. After five years, 61 (4%) participants in the ginkgo biloba group had been diagnosed with probable Alzheimer's disease, compared with 73 (5%) participants in the placebo group. The difference was not statistically significant, and the researchers also found no significant difference between the groups in the number of participants who had died or had a stroke. The study appears to confirm the findings of a 2009 trial which took place in the USA* and showed similar results. Together, the results suggest that use of ginkgo extract by elderly people who complain of memory loss will not significantly affect the likelihood of diagnosis of Alzheimer's disease. In a linked Comment, Professor Lon Schneider, Director of the University of Southern California's (USC) Alzheimer's Disease Research and Clinical Center, states that "If ginkgo biloba were a drug, and not marketed as a food supplement, clinical testing for efficacy against Alzheimer's disease and cognitive impairment would have ended long ago. Nevertheless, the fact that ginkgo biloba extract is widely promoted, derived from a plant, and fairly safe were reasons enough for its use in two landmark prevention trials for Alzheimer's disease [i.e. the GuidAge study presented here, and the 2009 GEM study*]… It would be unfortunate if users of ginkgo biloba, nevertheless, are led to believe that the extract prevents the dementia. Some users will rationalise that, in the absence of effective treatments, ginkgo biloba could still possibly help and, appearing safe, will not harm them. Other users of ginkgo biloba, however, might now consider letting it go."